Bettie (12 years old), Mabel (11), Jean (14), and Marjory (13) are four young girls who are neighbors and best friends. When they discover that an empty cottage has been standing on the property of their local church since long before the church even existed, they long to fix it up as a playhouse. Fortunately, Mr. Black, one of the church wardens, is fond of the girls, and he agrees to let them have the house in exchange for their hard work pulling the dandelions that have grown up around it. The girls complete this task and go on to turn the ramshackle building into a very admirable playhouse. When new neighbors move in next door, however, Dandelion Cottage is suddenly under attack, and the girls must work to save it from being taken away from them. This book, which I bought in hardcover, but which is also available on Project Gutenberg, is an utterly charming story of friendship, resourcefulness, and fun. 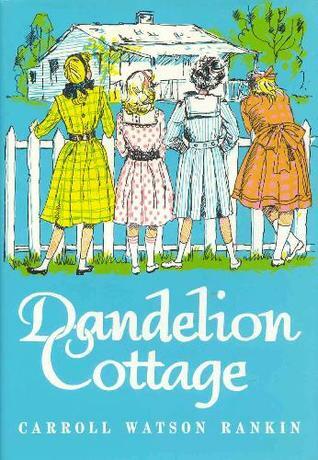 The four girls each have their own distinct personalities, and these create much of the tension in the early parts of the story as they work out how best to use the little cottage. The girls also have many small adventures as a result of spending time in the cottage, including hosting an overnight guest, planning a dinner party, and protecting the house from the bratty daughter of the new neighbors. The story is a wonderful testament to the ingenuity of kids and the value of using their imaginations to make their own fun. My oldest daughter is only four, but she already reads on a second or third grade reading level, so I am constantly thinking ahead to books that will be challenging enough for her in the next few years that will also be age-appropriate in terms of content for a child of six or seven. Though the characters in this book are significantly older than that, the conflicts they face and the details of their home decorating are exactly the kind of thing that will appeal to her, and there is nothing in the book at all that I would consider inappropriate or beyond her understanding. The text, meanwhile, is just descriptive enough to pose a bit of a challenge to a reader at a fourth or fifth grade level. I think it will be a perfect choice for her to read independently as her reading ability progresses, but it could work just as well as a read-aloud. The story moves quickly, and the chapters are the perfect length. To my great excitement, this book turns out to be the start of a four-book series! The sequels are also available from Project Gutenberg: The Adopting of Rosa Marie, The Castaways of Pete's Patch, and Girls of Highland Hall. I imagine that anyone who has loved the Betsy-Tacy books, The Railway Children, or even The Boxcar Children will be as pleased as I was to discover this wonderful little quartet.